This information is also available under our Pacific Cruising Information and our Australian Destinations sections. As we've mentioned elsewhere, Brisbane is both a good port of entry and a delightful place to sit out cyclone season. This page documents where we stopped as we cruised from Brisbane to Darwin. It is by no means comprehensive - for that you must get Alan Lucas' cruising guides (and please don't use copied versions - Alan's a cruiser just like us; we met him and his wife and son during their circumnavigation in the 80s). For Southern and Western Australia and Tasmania, check out Jack and Jude's excellent website as they chronicle their voyages in their 37' cutter Banyandah. Of course, Noonsite also has excellent coverage of Australia. 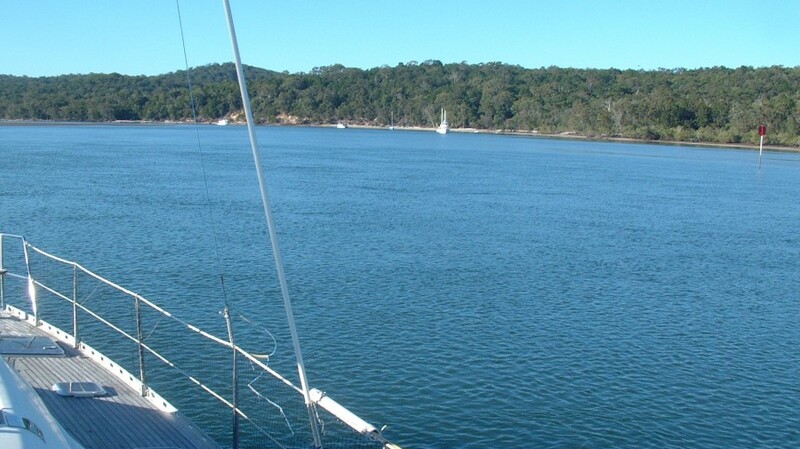 We remember sailing along the Australia coast fondly - it was some of the best sailing we've ever done. We sort of flew up the Queensland coast as we were feeling late to get to Darwin in time for the 2006 Darwin-Indonesia Rally. So we sailed 1,370 nautical miles from Brisbane to Seisia (on the west side of the York Peninsula) in only 28 sailing days, for an average of just under 50nm/day. Luckily, once we got to the Percy Isles, the SE trades started blowing with a vengeance, so it wasn't hard to clock up some impressive daily runs, as we only did 2 overnight sails in all that distance. The table below, with the more in-depth comments below that, lists all 32 anchorages we visited on our way from Brisbane to Darwin. The anchorage links go to the in-depth comments below, and the photo links usually show the anchorage or its approach if we have them. 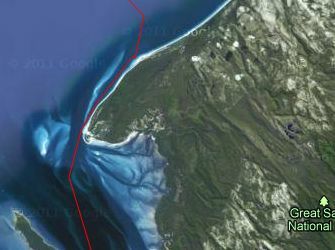 Recently we added Google Map satellite shots of each anchorage, with our track in and out (our anchorage is usually pretty obvious from the track). These are much better than mud maps! Depths are in feet, distances are in nautical miles, latitudes are all south, and longitudes are all east. As always, if you have questions or comments, please contact us - we'd love to hear from you! 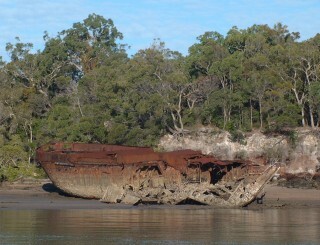 The Tangalooma Wrecks (we love these Australian names!) 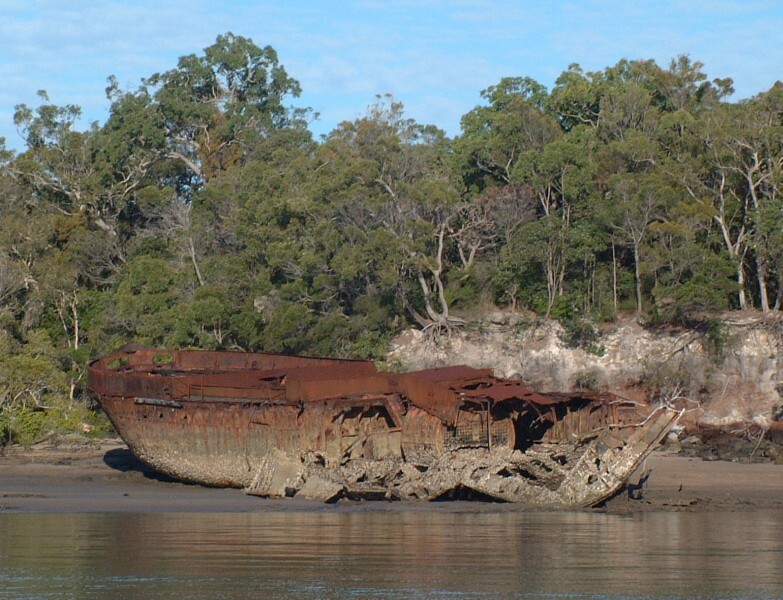 are a series of rusting old ships that were towed to this popular Moreton Island anchorage and scuttled to make a breakwater. The breakwater is only moderately effective, but the wrecks yield an eerie ambiance to the anchorage, as well as providing habitat for fish and snorkeling opportunities. We had a bit of difficulty finding a good anchoring depth as we wanted to go right up to the northern end where it gets a bit narrow, but the sand provides good holding. There's plenty of water to enter and exit to the north, but our track of the easier southern entrance has, unfortunately, been lost. 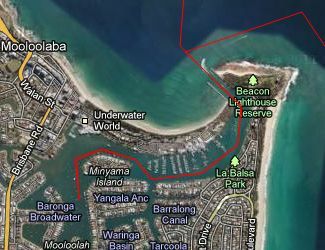 Our sail to Mooloolaba was a bit accidental as we hadn't planned to go there but we'd blown out the clew of our spinnaker and needed to get it repaired. The entrance is pretty straight forward using the good leading lines. The pilings, for those so inclined, are just inside the entrance on the right, as is a big marina (other marinas are sprinkled around). We do not recommend contacting the Coast Guard prior to entrance, as they sometimes make it sound like you have to go to a marina, which can be quite expensive. 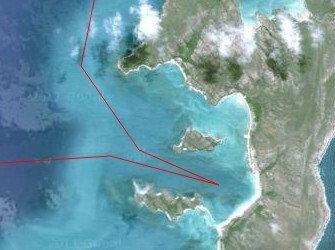 The anchorage is past the Coast Guard station, on the far side of a small island. It's shallow and can be crowded with local boats, but there's lots of room. We can recommend sailmakers Colin & Debbie Quin (phone 5450 6889 or mobile 041 883 2615). They quickly collected, repaired, and delivered our spinnaker for us and then charged us $50 less than their quote! But Sunshine Liferaft tried to charge us almost twice as much as their quote to service our liferaft, so I'd stay away from Sunshine. 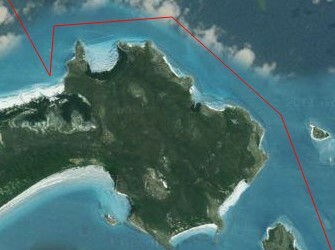 We tried to sail to Double Island Point but the wind died on us so we ended up motorsailing much of the way. 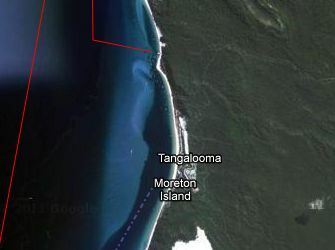 We're told an anchorage can be made behind Noosa Head, but we wanted to get further as we were feeling behind on our schedule to get to Darwin for the Rally. 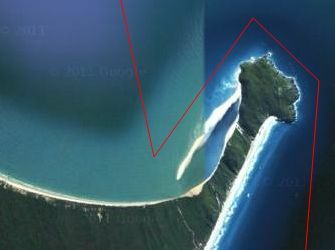 The anchorage behind Double Island Point is well protected from all winds with some south in them, but you need to watch out for the (usually visible) rock 1.1nm off the point. 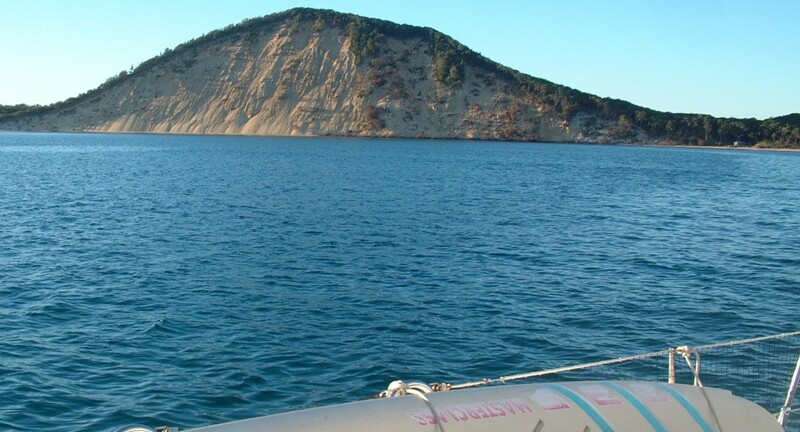 We had no problems sailing inside this rock, passing just outside the shallows about 0.6nm off the point. The wind had died and we didn't want to motor all the way around Fraser Island, so we decided to take the more visually interesting passage inside Fraser Island, through Wide Bay Harbour and up the Great Sandy Strait. The Wide Bay Bar at the entrance should only be attempted during settled weather and, ideally, about the middle of a rising tide. We never saw less than 10' (3m) but the swells can get quite large and sometimes break. 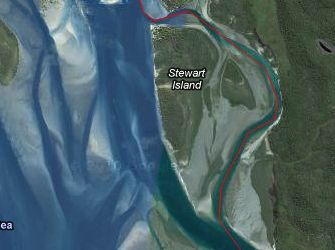 Near Stewart Island, our old CM93 charts completely gave up but the newer charts seem to be fine. Australia sells a pair of of excellent charts for this area. Gary's Anchorage in a delightful wide spot off a side-stream that offered nice opportunities for beach excursions, and we saw several animals there, including Sea-Cows. We always moved at or near high water, usually on a rising tide, and never saw less than 9' (2.6m). Some monohulls we were traveling with nudged the mud-banks on the sides of the channels, but they were going slowly and got off fairly easily. Leaving Gary's, we found we could continue north to meet up with the main channel instead of back-tracking to the main channel before heading north. Minimum depth we saw was 11' (3.3m) at high water. The trip north from Gary's anchorage goes over the "top of the hill" near 25º33'S latitude. This is about where the tidal currents change, but we saw no less than 12' (3.6m) at high water so most boats should be able to get through if they watch the tides. 3.5nm past that point we doubled back along the coast, past the conspicuous wreck, to the long South White Cliffs anchorage. There's a campsite with an info-board a bit north of the anchorage, but no drinking water. 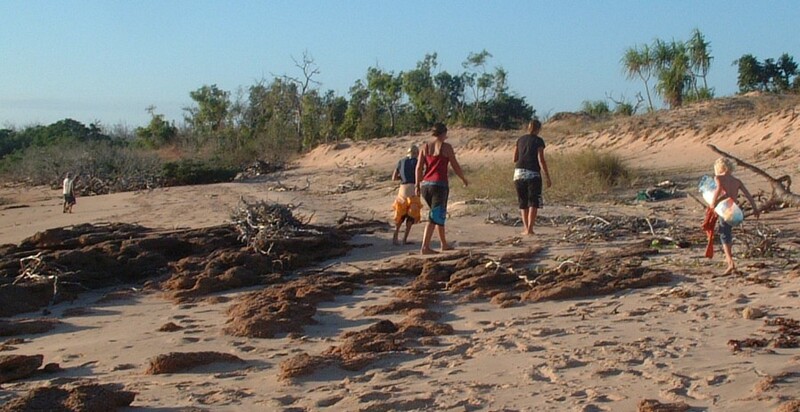 Like most Fraser Island anchorages, there are walks along jeep-tracks into the interior of Fraser Island, but it's a good idea to carry a stout stick with you in case you run into dingoes. 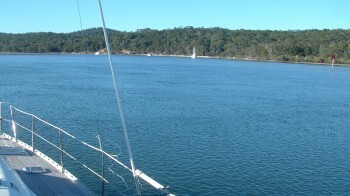 The sail north into Fraser Bay is generally in deeper water and not so troublesome. We took the ferry pass to the inner channel, just off the end of Moon Point, and never saw less than 12' (3.6m) at mid-tide. The anchorage is not so much a point as a vast expanse of shallow sand - just go past the ferry landing as far as you want and pick a spot. Then go ashore to explore the extensive sandbanks and the millions of tiny sand crabs. The charts show a fresh-water creek but it's only fresh-ish at low tide. There was a boat anchored up the creek when we were there (must have gone up on a very high tide) but it didn't look inviting. 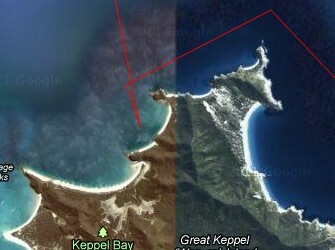 From Moon Point we did one of our 2 overnight sails to get to Great Keppel Island. This is a fairly straight shot so easy to sail. We seriously considered visiting Lady Musgrave Island, as it's reputed to be delightful (although it needs settled conditions) with excellent snorkeling, but again we were feeling pinched by the calendar. We actually anchored to the left (ahead) of the other boats in a little sandy bay as we found the rest of the anchorage a bit deep. Approaching Port Clinton is actually easier than it looks. 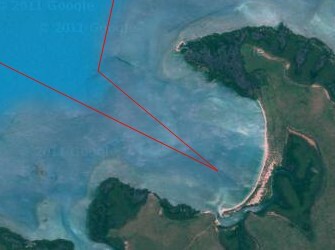 There's plenty of water north of Round Island, and the shallow bit just past there had 12' (3.3m) over it at low water. 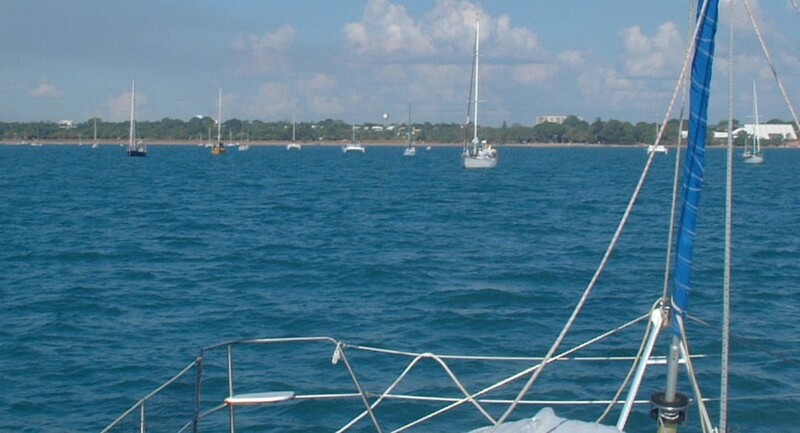 There are several anchorages inside the sprawling bay that's Port Clinton but you need to watch out for shallows. We anchored on a sandy stretch just under Mt. Flinders. This sandy bit is large enough for several boats and provided good holding and excellent protection from any winds with any east in them. We're told there's another good anchorage about 1/2nm further south (and the chart shows several more possibilities) but we didn't investigate (or even take any pictures, it seems). 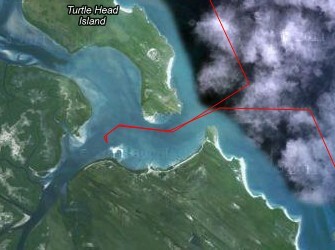 Island Head Creek is only 11nm NNW of Port Clinton. We went outside tiny Delcomyn but inside Dome and Split Islands without any problems. The entrance was straight-forward and we found plenty of water, even over the shallow section shown just inside the entrance. But nosing about we found several areas that shoaled very rapidly, so be careful and watch your depth-sounder. 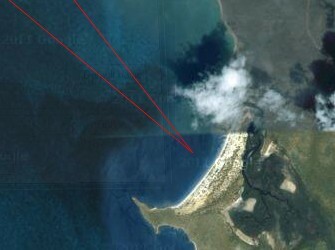 Both S Percy and NE Percy Island have good anchorages with protection from the predominant southerly winds. We made good time coming up from Island Head Creek so chose to go all the way to NE Percy. Some of our documentation disagreed on the exact location of Graf Rock but it was easy to avoid all possibilities. The anchorage is a bit deep (we anchored in 35' or 11m) but surprisingly protected given that most of what was in front of us was just rocks. We had a wonderful spinnaker run from Percy Island up to Scawfell Island and were surprised to find good friends on Leprechaun anchored there already. We chose to anchor in the first little bay on the SW side of Refuge Bay. The normal anchorage is much larger (and probably better protected if it's blowing hard) on the SE side of the bay, but 2-3 boats can find seclusion away from the hoards in this little SW bay. Both anchorages can be tricky as the coral comes out a fair way from shore, and we found ourselves re-anchoring once or twice so we could lie happily with our chain in sand. Scawfell Island was delightful, with good snorkeling, a lovely white-sand beach, and lots of boulders to explore on the right hand side. From Scawfell Island north, the SE trades started to really kick in, so we put the spinnaker away and opted instead for running wing-and-wing. Thomas Island provides OK protection for a few boats in these conditions, but it's much smaller than the more popular Shaw Island, 5nm further NW. 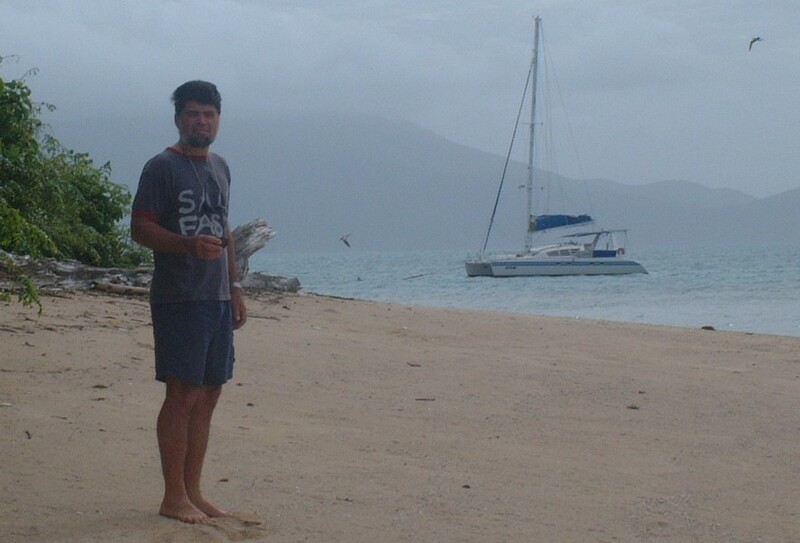 We chose it because of that isolation, so we could avoid the hoards of bareboats that infest the Whitsunday Islands (which we had cruised in 2000 and decided not to repeat). Note when leaving that Long Rock is actually somewhat south of its charted position. Good friends of ours own Queensland Yacht Charters in Airlie Beach, so we were able to pick up one of their moorings. The anchorage off the marina is shallow mud and protected from winds with any south in them, but it's actually rather crowded, with most boats on moorings. 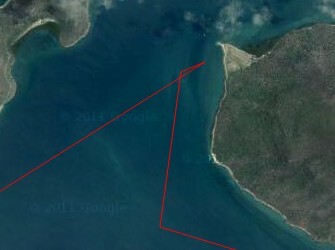 There's a more protected anchorage to the east in Muddy Bay, but it's harder to get ashore from there. Most cruisers seem to go to the big marina, despite its fees and tricky entrance. Most facilities are available, including a small chandlery, but the nice big new shopping center is a bus or taxi ride away. We had access to a car so we could fill our jugs at a normal filling station, but there's a (more expensive) fuel dock in the marina. 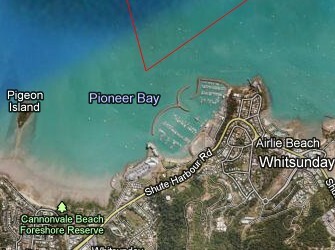 From Airlie Beach we did another overnight passage to get to Townsville. 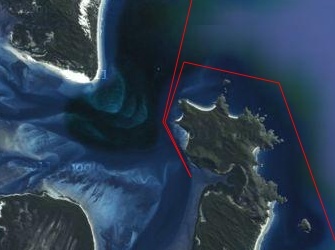 This bypassed several protected anchorages (Edgecumbe Bay, Abbot Bay, Upstart Bay, Bowling Green Bay, etc.) but none of these are on islands and we wanted to get to our friends in Townsville for the weekend. 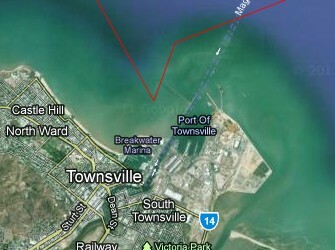 Townsville has several marinas but we anchored in the shallow mud behind the breakwater, just off the dredged Breakwater Marina Channel. Townsville is less touristy than Airlie Beach, but all facilities are available. We exited Townsville by sailing inside Magnetic Island and Bay Rock, and found the charts accurate with plenty of water. 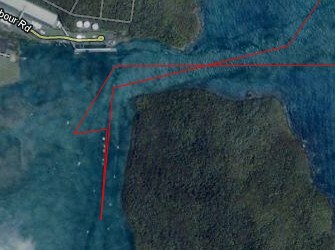 Our Shepherd Bay anchorage on N Hinchinbrook Is. Coming from Townsville, we sailed NW through the Palm Isles, between Eclipse Island and Falcon/Brisk Islands, next to the old Steamer Passage. Again, the charts were accurate and there's plenty of water. From there, the route to Shepherd Bay at the north end of Hinchinbrook Island is straight-forward. With the SE winds blowing so strongly, we anchored in the far western corner off a small beach to get the most protection. We might well have gone out to the Great Barrier Reef as we sailed between Townsville and Cairns, but the weather was uncooperative, with strong south-easterlies and occasional wet rain-squalls - not the sort of weather one wants at a poorly protected reefy anchorage. So instead we stayed close to the coast, looking for protection more than scenery. is on the right, the anchorage is around to the left. Mourilyan Harbor is only 41 miles north of Shepherd Bay, but the day was wet and the next protected bay, Glady's Inlet, looked too shallow for us. Mourilyan Harbor is a sugar shipping terminal so it takes big ships, which use much of the available space for a turning area. The terminal suffered some damage in Cyclone Larry that clobbered the area in March 2006 but the leading lines were still fine, so getting into and out of the bay is straight-forward. There are some pilings on the south side of the bay, but after poking around for a while we decided to go past the pilings and anchor in the river. The river shoals quickly beyond that. 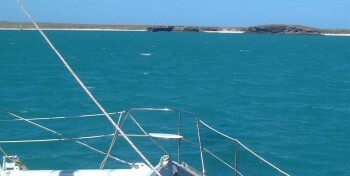 The sides of the turning basin shoal too quickly to anchor on the fringes. Our trip to Cairns was again very fast, as the SE winds were blowing hard. Entering the river is straight-forward but most boats have to use the dredged channel, entering it at an appropriate point considering depth and the state of the tide. CM93 charts appeared to be spot-on accurate. We anchored on the east side of the river slough, opposite the marinas. Given the crowding and the tidal currents, this was not a good long-term anchorage, and we sat anchor-watch as the tide changed to make sure we didn't touch any of our neighbors. The charts show more marinas, pilings, and anchorage locations further up-river, but we didn't investigate. Cairns is the last place to stock-up before Darwin, which, at 1,250 miles away, took us a month to get to (although some expensive supplies can be bought in Seisia). 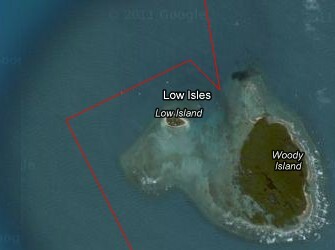 Low Isles is a group of 3 isle-lets surrounded by coral reef. The shipping lanes separate them from the Great Barrier Reef, 8 miles to the east. The parks department has put in 3 public moorings that are available free on a first come, first served basis. These proved surprisingly comfortable and protected, given that only coral was in front of us. However, friends of ours anchored ahead and to the right of the moorings, and reported that they were both secure and comfortable. The western-most island has a nice big lighthouse and some historical buildings. There was a very friendly lighthouse- and grounds-keeper who was happy to show us around. 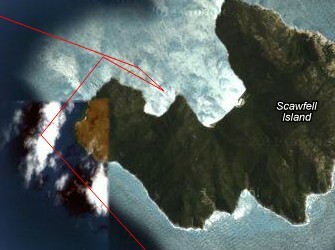 We had another flaming fast sail up to Lizard Island, dodging between the shipping lanes and the Great Barrier Reef. Lizard is one of those magic places where you want to stay for a long time - lovely snorkeling over good coral, beautiful white sand beaches, hills to climb and explore, there's even a supply of water for those who need. 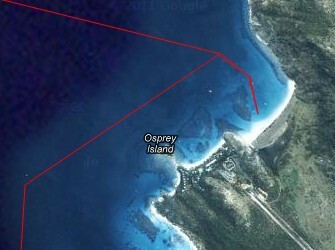 The resort has an airport and, while they don't encourage yachts, you can get internet access there. At the north end of the beach is a campsite that the yachts used to meet at in the afternoon for sun-downers. There's a treasure chest there from "HMS Pandora" as well as a guest book. That's also where the trail starts to go up to the top of Cook's Look, which offers spectacular views of the reef enclosed bay on the far side. 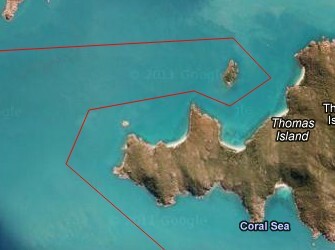 Getting into Lizard Island presents no problems if you stay to the left to avoid the big coral patch (shown in the photo as darker areas). Ocelot's the topmost boat in the photo, and we dropped the hook in 8' (2m) of pristine sand, but the rest of the anchorage is deeper. There was a mooring behind us, but it was obviously for smaller boats, as it was much too close to the reef for us to use. 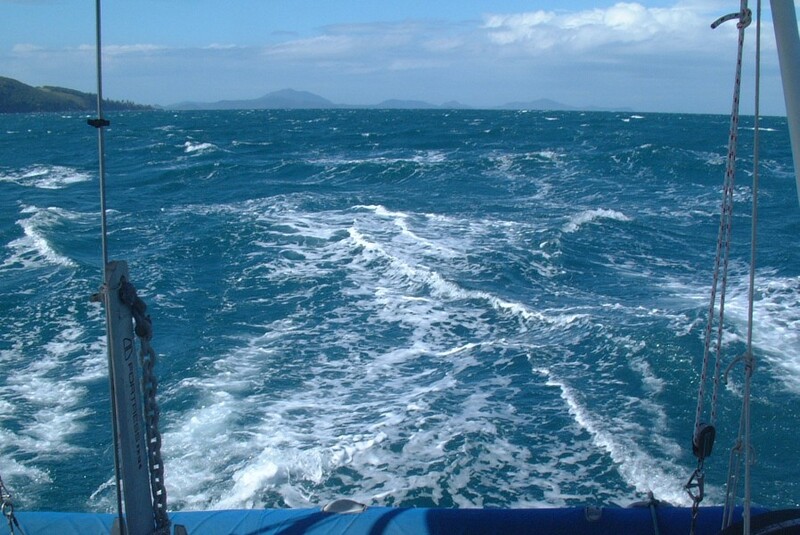 Flinders Island is 83 miles NW of Lizard Island, but the SE winds blow so strongly through here that we sailed it easily in daylight hours, leaving at 6:15, surfing at times to over 13 knots, and arriving just after 5pm. The route follows the shipping channel so yachts need to keep a good lookout for reefs to the right, and ships front and back. AIS would be useful here as visibility can be very poor in squalls. 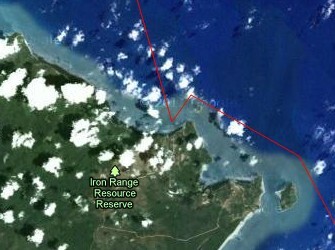 Particular care must be taken when rounding Cape Melville, as the winds really accelerate there. We sailed inside Boulder Rock and had ample water, but we saw 40 knots of wind. Boats anchored in Bathurst Bay were trapped by 50 knot winds that prevented them from picking up their anchor! There are several anchorages at Flinders - we went to a nice sheltered shelf off the east end. Since we'd caught 2 nice fish we also ended up feeding the fleet - 16 people for dinner after sailing 83 miles! 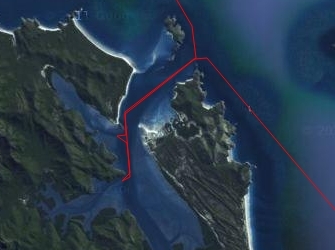 We chose a minimum length path for the 57 miles to Morris Island, crossing the shipping channels and then staying just inside the many reefs to the right. The light/buoy shown on the charts at 13º57.5'S 143º48.9'E was not seen when we went past in 2006 but it's hardly necessary. 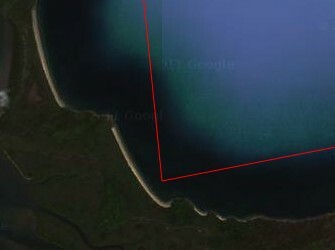 There was also a sand spit that extended NW from Fife Island that wasn't charted, but otherwise the CM93 charts seemed accurate. 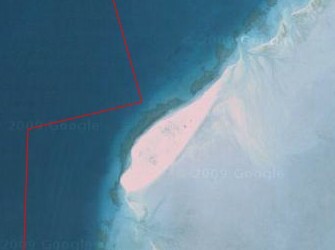 The reef around Morris Island is much larger than the island. 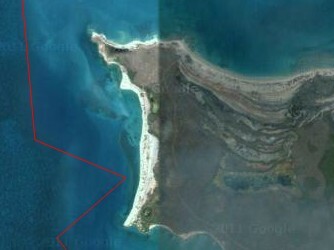 We anchored just NW of the island but there's a large sand-bank to the NE that looked protected, especially at low tide. Walking around the island is interesting, with birds nests in the sand, nesting Osprey in the snags, and a lone gravesite. We again chose a fairly direct path for the 61 miles from Morris Island to Cape Weymouth. 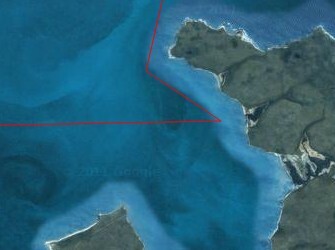 We skirted between Drake Shoals and Blanchard Reef, then between Waterwitch Reef and Glennie Reef, made a rather oblique crossing of the shipping lanes but kept well outside the shallows off Cape Direction before passing between Restoration Rock and Restoration Island and on to our anchorage at Portland Roads behind Cape Weymouth. Unfortunately, the weather really socked in towards the end, to the point that we almost hit a couple of southbound fishing boats (and didn't take photos). The anchorage itself was blessedly protected but otherwise unremarkable. 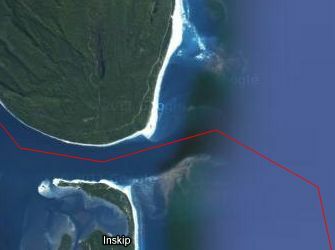 From Margaret Bay it's a long 71 mile sail to Escape River, but it cuts the sail to Seisia into 2 day-sails and makes it much easier to choose the tide when transiting Albany Pass and going over the top of the York Peninsula. Most boats are put off by the charts, which show the Escape River bar as having only 8' (2.5m) of water, but we found that there was fully 13' (4m) of water even at low tide when entering and leaving on an east/west line at about 10º57.2S. A more important concern are the large and uncharted pearl-farms just inside the entrance. Once past those, there are several good anchorages. We chose one near the entrance as we wanted to leave early to catch the tide for the Albany Pass. The trip over the top of the York Peninsula to Seisia was the culmination of over 1,300 nautical miles of enjoyable but hard sailing. But you want to transit Albany Pass (SE to NW) on a rising tide to have favorable currents, which can run at several knots. Also, the waters west of the York Peninsula can be shallow, so a high tide will help. We found several un-charted pearl-farms in the shallows, so keep a good lookout. Use the charted ranges when approaching Sesia to stay in deeper water. 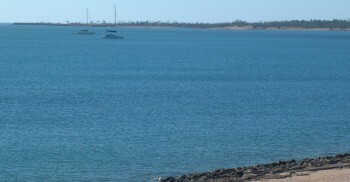 The anchorage is in good sand just past the jetty, but leave room for the small freighters to enter and leave. 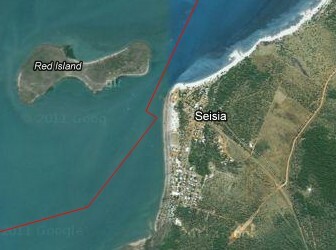 Seisia has a fuel station not far from the jetty and a nice grocery store south of the anchorage but close to the beach. Water is available in the park, and showers, washing machines, and drying lines can be had at the campground. A good place to relax and catch your breath before the next leg to Darwin. Vagabond Heart is just visible in the upper left. The Gulf of Carpentaria is very shallow and can turn into a real washing machine in strong winds, making for a very uncomfortable sail. Boats that went ahead of us generally had a rougher time of it, but we had a delightful 2 night passage. After clearing the shallow banks to the west of Endeavour Strait we headed for Marchinbar Island, the northernmost of the Wessel Islands. Some boats went to Gove, but this put them harder on the wind, with lots of strong currents and narrow channels to negotiate afterwards. 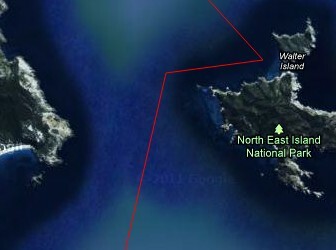 We gave Cape Wessel a good offing and then found a delightful anchorage in the northern half of Two Island Bay. We had fun exploring the rocks and found what appeared to be petrified sea-bed, with the sand-ripples still visible. We chose to head from the Wessels to Malay Bay, just past Cape Cockburn on the mainland. This is not a common stop and there's nothing much there, but it was only a single overnight and allowed us to day-sail the rest of the way to Darwin. There was still a fair amount of wind (the GPS says that Ocelot exceeded 13 knots on both this leg and the leg from Seisia to the Wessels) but the seas were relatively flat, making for a pleasant passage. Entering Malay Bay is straight-forward as long as you give the rock north of Cape Cockburn a good offing. Then just go as far as you want into the bay and anchor wherever seems appropriate. Most likely you'll have the whole place to yourself. 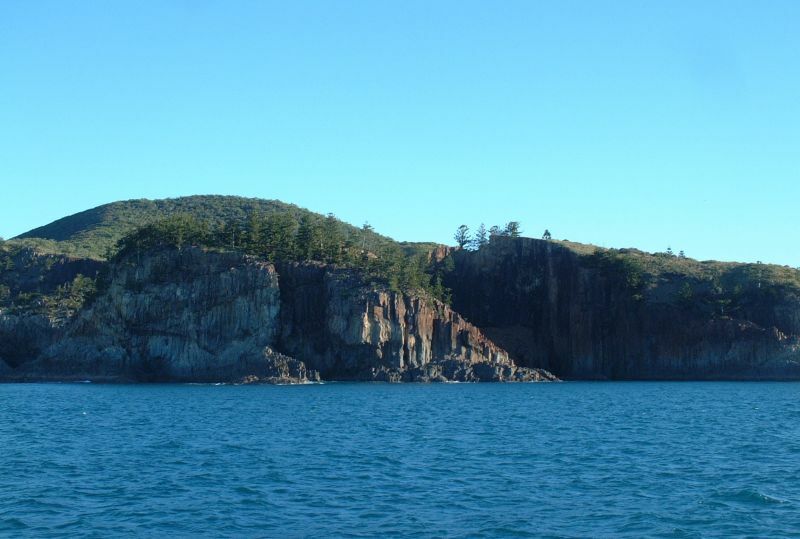 The 57 mile sail from Malay Bay to Port Essington involves going up Bowen Strait, inside Crocker Island. We found the 2005-series CM93 electronic charts to be both lacking in detail and inaccurate for this leg. We found the best deep water to be along the eastern (rightmost) edge of what's marked as deep water on the charts. Any further west (into what's marked as deeper water) resulted in shallower water. 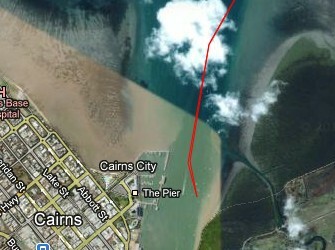 This is born out if you expand the Google map - the deeper water is to the right (east) of our track. We also found that the shallows off Smith Point extended somewhat further out than charted. The anchorage off Black Point was straight-forward, but a swell tended to creep around the point in the SE winds we were experiencing. Ashore is a nice ranger station with interesting exhibits and some walking trails for the hardy. Although Black Point was nice, the swell got bothersome, so we moved 6 miles SSE to Berkeley Bay, which was much more protected. 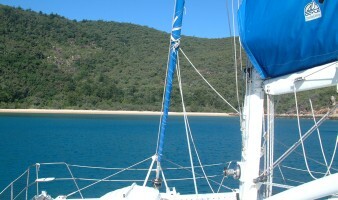 We anchored in the middle of the bay in 20' (6m) of good holding sand. There's no ranger station (or anything else) ashore but we had fun exploring the long beach and walking up Caiman Creek. Although we saw no crocodiles, we saw lots of tracks in the sand, many of them fairly fresh. 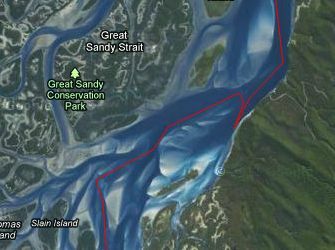 We put together a fairly elaborate spreadsheet to work out the best leaving time to catch the tidal currents through Van Diemen Gulf and Clarence Strait. It worked out that 2am was the optimal time so we didn't get much sleep but we fairly shot down Dundas Strait with a 5 knot current assist. 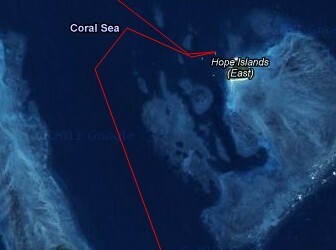 We went outside (SE) of Ommaney and Renard Shoals, then NW of both Beagle Shoals and NW Vernon Island. 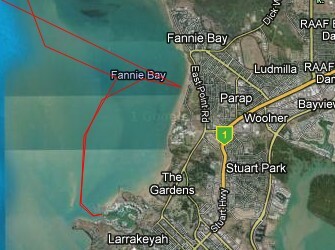 Then we turned SSW until we cleared the shallows and could head straight into Fannie Bay, Darwin. Care must be taken when anchoring to account for the tides, which can run 25' or 8m! 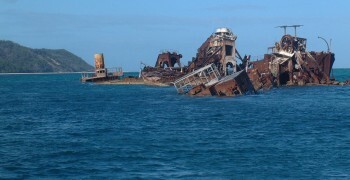 This meant that even catamarans had to anchor fairly far out or risk grounding at low tide. But it also means that it's easy to careen on the beach to quickly scrub the bottom, and several stands are around for that. 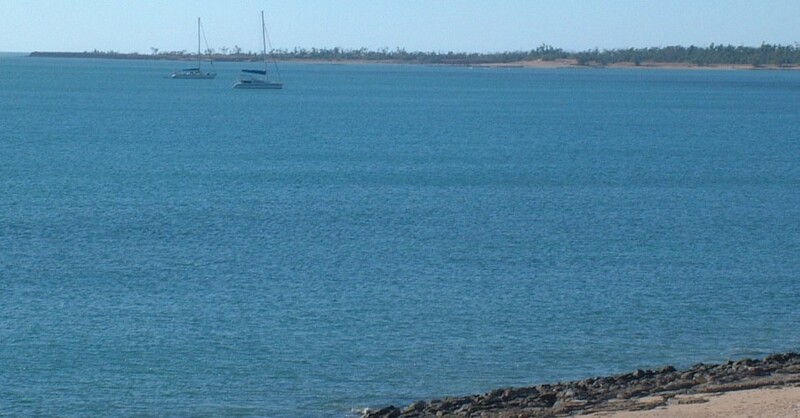 There's another anchorage south of Darwin in Francis Bay if the winds are blowing from the north, and there are several marinas, some of which have locks to control the tidal change. But before entering the locks the officials will probably pour some chemicals in your toilet and make you wait 18 hours while it kills any bugs it finds. There's a fuel dock behind the breakwater next to the entrance to Cullen Bay Marina, but some of the operators are stingy with the water, which has to come from the fire-hose (Fannie Bay is too muddy to use a watermaker). They also wouldn't let me use my Baja Filter for the diesel. The yacht chandlery at Cullen Bay can get cooking gas bottles filled. 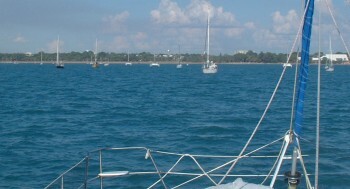 Busses run fairly often from the sailing club to downtown Darwin and back. In 2006 we could buy a pass for a few dollars, but the equipment on the busses couldn't deduct the fare from the passes, so they lasted forever. There are big Woolies and Coles grocery stores downtown, and even bigger ones in huge shopping malls out of town. There are many yacht supply shops and you should get what you need now, because we haven't really seen a good yacht shop since we left, almost a year ago now. Note that first-world (Australian) bottom paint doesn't work nearly as well as bottom paint bought in Langkawi, Malaysia. The expensive Jotun bottom paint we put on in Darwin was useless just 6 months later. Sue's put together a document on SE Asia Provisioning, which includes recommendations on what to be sure to buy in Australia before heading to Indonesia and farther north. Check it out!